Me back after a really long hiatus. So much has happened in this period – much of it being what I would have wanted to write about. But it’s really too much to recollect and pen down now. So will stop with the most exciting experience of them all: My trip to Mauritius! My first ever journey beyond the boundaries of India. Though it was meant to be a honeymoon, I refuse to use the word cos’ it was more like an adventure trip. 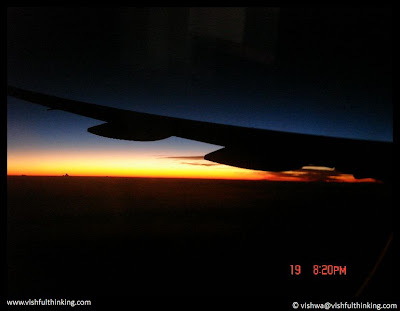 On Dec 28, the Misuss and I embarked from Bangalore. Our journey to Mauritius was through Dubai. Ya, it was a whole lot like “turning your ears and touching your nose” in a loose translation from Tamil. But that was the only route on which tickets were available for us. Enjoyed the Emirates Airbus 330 flight. Watched Lage Raho Munna Bhai and Jab We Met put together on the way. But only that the poorly made concoction was called Kismet Konnection. 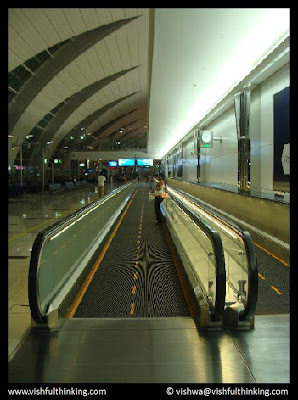 Once at Dubai, we spent a good 4 hours walking around one terminal of the huuuuuuuuuuuuuge airport (There were gates numbered in the 300s! 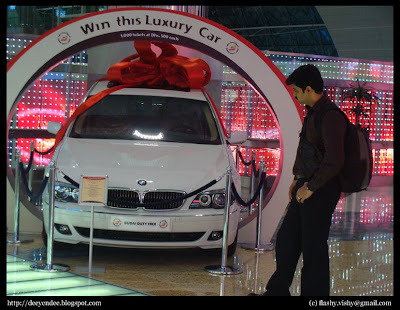 I think Chennai has around 10), ogling at the Duty Free shops and the BMWs and Benzes kept on display there, and walking up and down the travelator there. 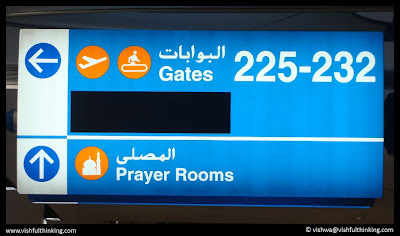 They have prayer rooms in the airport! Wonder what kind of such 'special' rooms we could have in our airports? 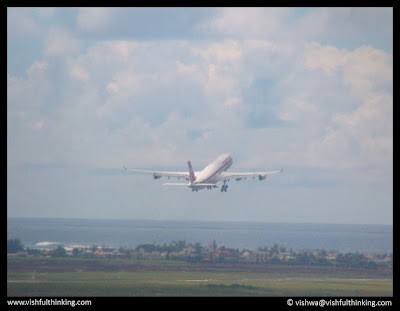 Then after catching a couple of hours of fitful sleep in an easy-chair of sorts, we finally got called to board the Boeing 777 flight to Mauritius. The flight started on the dot at 0235 hours. And my joy knew no bounds as I discovered that the in-flight entertainment collection had 260+ movies and numerous TV series. I got sooooo excited that I fell asleep at once. The 6 hour flight passed rather uneventfully. I woke up towards the end of the flight and peered out of the window. And was dumbstruck! Can you spot the ocean below the clouds? There was an unending expanse of this lavish splash of cool blue all around. The very sight was so refreshing. It was kinda scary too, to be hanging in the air somewhere above a vast ocean – more than two decades of relationships with terra firma have kinda spoilt me in that sense. Clearly this was even more striking. But how could I not have the last word? After ogling out of the window for a while, I turned on the TV in front of my seat. And I got the best in-flight entertainment I have ever got in life on board international flights (he he.. Technically this is true ;) ). There were a couple of channels that showed what it is to sit in the cockpit! 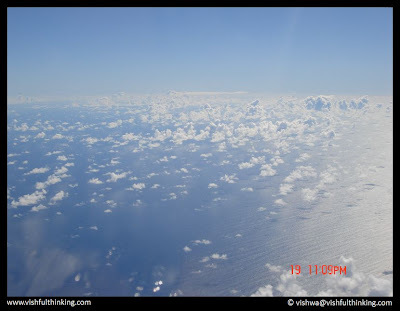 There was a live feed from cameras placed below the nose of the plane, and it was very exciting to look at so many clouds pass by at breakneck speed. Gradually we left the ocean behind and began flying over landmass. Pretty soon we reached the airport. A very quaint little airport flanked by green hills on one side and the deep blue ocean on the other. Has to be seen to be believed! And do you know why Pilots get paid bucket-loads? Cos you need to put up with 300+ back seat drivers. The very camera that was giving me thrills a few mins back, started giving me scares. The way the flight was going, I did not for a moment feel that the pilot was flying it in line with the runway that was closing in soon. I almost made a dash to the cockpit to turn the steering stick a bit to the left (what the heck.. it was so obvious from that cam). Somehow in a last minute manoeuvre the pilot made sure we landed on track. And the moment the rubber hit the tarmac, it seemed like the entire crew of the aircraft had mounted itself on the brakes. The drop in speed was a bit too harsh. And then I realized why. Remember I said it was a quaint little airport? I meant it in all senses. If the pilot had taken time to say “Hiya Mauritius.. Here I come” before applying the brakes after landing, he would have had to say “Hiya Indian Ocean.. Here I already am” at once. The runway was toooooooooooooo short. The flight went right up to the end of the runway before taking a U-turn and slowly taking its rightful place near the exit. In a few minutes, we had made our way to the visitors’ hall where we had to get our visas from one of the 20 counters. It was so bloody crowded that Ranganathan Street appeared in my inner eye for a split second. Anyway, the formalities were done in half an hour, and we made our way out of the airport. Prayer room reminds me of "office room" :P :). Hope u had nice fun and time. It was interesting to note that you have the energy to create and share your experiences for the benefits of those (tiny little mortals) who may not have the opportunity to see MA - RITI - Us..??? Hiya Indian Ocean.. Here I already am. Height of Vishful Humour. Super post. Carry on. I know this is the wrong place to wish ya a great future ahead, still... "Happy Married life"